BEDFORD, MA -- After closing out the month of September with the best start in franchise history, the East Coast Wizards kept things rolling with a solid month of October. Through their first 12 games, the Wizards owned a record of 8-3-1, which put them just a point behind the Seahawks Hockey Club for the top spot in their division. 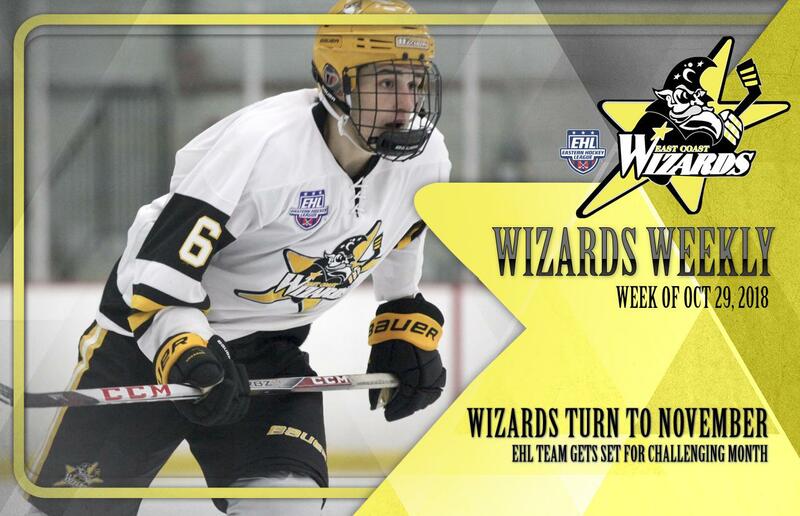 Last season the Wizards finished as the #4 seed in their conference and got matched up with the Vermont Lumberjacks in the First Round of the EHL Playoffs. The team took care of business in that series, but to Meyer’s point, the Second Round against the New Hampshire Avalanche was a different story. It was clear which team just had a little more in the tank, in large part because of the First Round bye. Focusing back in on this year, the Wizards know that the EHL Playoffs are a long way away, and there is a lot of hockey left to be played before then. Looking at their upcoming schedule however, the Wizards only have 2 home games left in 2018. Following the holiday break, the team will get to enjoy the friendly confines of The Edge Sports Center a total of 11 times, but Meyer really likes the way he set up the schedule. The November schedule features 9 total games, starting with a big 3-game swing in Philadelphia. Remember you can catch all the #Eshow action live on HockeyTV, and be sure to keep up on all things Wizards at ecwjrhockey.com or by searching #BringTheMagic on Facebook, Twitter, and Instagram.